This is a simple powered loudspeaker that was originally intended to be used as a simple piece of test equipment. It is based around a small full-range loudspeaker that I'd inherited, which originally came from Radio Spares. 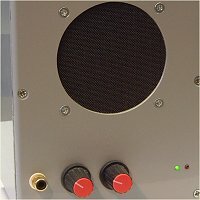 The basic idea was to mount it in a diecast aluminium box, treated to make it as acoustically ideal as possible, then add a simple amplifier using active equalisation to make the unit sound acceptable. Originally, the project was intended to be used when servicing audio equipment, but shortly after completion, I finally got around to fitting a pair of phono sockets into the workshop connection panel for doing exactly this. This meant that the unit, which actually sounded quite pleasant, spent most of its time as a bed-side radio. Enclosure - Details of the case that was chosen to house the loudspeaker. Electronics - Circuit design, with detailed explanations of the building blocks. Modifications - Recently, a series of modifications were made to the unit.